Ernest was Sonia’s Grandfather. He was Private 3/7432, 2nd Battalion, Alexandra, Prince of Wales Own (Yorkshire Regiment). 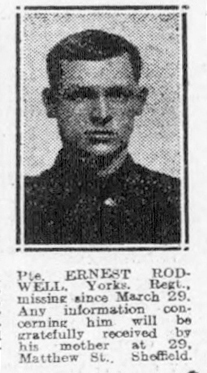 Born at Brightside, Sheffield on 12/2/1894 he was killed on 5/4/1918 and is buried at Roye New British Cemetery, grave ref. IVC 14.